We’re indebted to our generous sponsors who are committed to end Alzheimer’s disease and other dementias. This year, we’re thrilled to welcome IG Wealth Management as the title sponsor for our annual fundraising Walk! IG Wealth Management has a long heritage of community involvement, corporate funding and project initiation that has created a strong corporate culture of caring. In 2016, IG Wealth Management made over $6.9 million in charitable donations across Canada. As a company, IG Wealth Management has been committed to helping their clients with their financial planning needs for decades. From a community investment perspective, their focus is on improving the financial confidence of those living in the communities they serve. This partnership aligns strongly with IG Wealth Management’s community investment focus, as there are very unique and challenging financial realities for the sandwich generation—those caring for children and parents who may be living with Alzheimer’s disease. IG Wealth Management is committed to supporting these families through involvement in the Walk, and beyond. 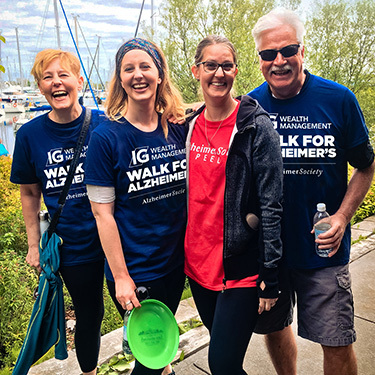 We are proud to partner with IG Wealth Management and look forward to making 2019 the most successful Walk season to date! Thank you to IG Wealth Management and our sponsors across Canada!